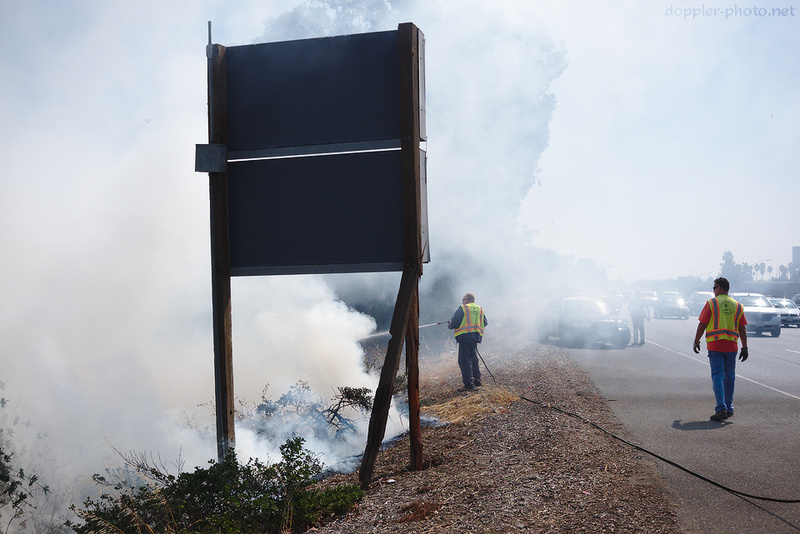 I was driving northbound on US-101 when I saw smoke emanating from something burning in the distance. As I approached, I realized it was an untended brush fire, burning the vegetation on the side of the road. I stopped. The easiest way to keep a small fire from turning into a big fire is to take care of it when it's still small. So I dialed 9-1-1. I dialed again. Busy signal. That was when my hands started to shake. To be sure, I have panicked before. I panicked when the ceiling of my dorm collapsed under a flood of hot water. And then I dialed the emergency number that was listed on my room phone, and then I got out. But it's different when you're panicking, and the obvious next step turns into a dead end, and suddenly you have to figure out what you're gonna do about it. The adrenaline clouds your thinking either way, but the reason that 9-1-1 is repeated everywhere, all the time, is so that you don't need to think; you just do. That was no longer an option. After what was likely under a minute, though my perception of time was completely unreliable by that point, another motorist stopped, and I got him to call. Emergency services were already on their way. He took off, and a little bit later, a Foster City water truck showed up, followed in short order by a CHP squad car. *Phew*. I took a couple pictures and left.